Features: It features a brake winch for easy raising and lowering; 34-feet of 3/16" stainless cable; twenty-four horizontal Gourd Mounting Arms. The all-aluminum hub has nylon glide tabs for squeak-free operation. A 3-inch-square aluminum pole assembly with a ball top and 72-inch long solid aluminum 3/8" top perch rods. Eight, 1-1/2” x 48-inch long aluminum angle arms with gourd-hanging holes 16” on center, 3 sets per arm. The cross-bar design makes nest-checking quick and easy. Cable pulley, stop pin and safety pin are also included. Materials: Aluminum pole, aluminum heavy-duty ground stake, aluminum hub, aluminum angle arms. Twenty-four solid aluminum 3/8" Gourd Mounting Arms are also included. Gourd Mounting Arms: Twenty-four 3/8" solid arms. There are eight each of the Horizontal 90, straight and 45. 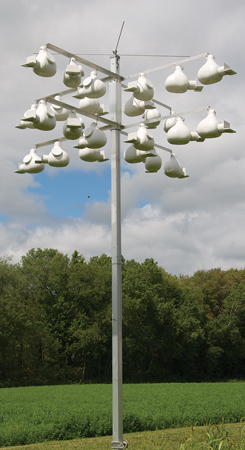 Vertical Gourd Mounting option includes 14 Vertical Straight and 8 Vertical 90. Gourd Mounting Arms can be attached using a stainless bolt and nut. Slip your gourd onto the GMA and insert your supplied stainless hitch pin. The pin will keep your gourd from falling off. Gourd Accommodation: Any plastic or natural gourd can be fitted to these gourd mounting arms. Horizontal GMA's: If your gourds are not already drilled front to back in the upper neck, use a 13/32" drill bit to enlarge the hanging holes. Extras: The Super System is the only gourd rack that includes the GMA45, when choosing the Horizontal option, which are used in the center of the aluminum angle arm. This GMA will place your gourds entrance at a 45-degree angle. Aids in male martin dominance.